Left to Right: Simon Li (RMH), John Mitsios (Austin), Eva Windle (St Vincent’s), Harrison McKenna (St Vincent’s), Matthew Megens (Austin), Siaw Wee Teo (St Vincent’s), Olivia Galante (RMH). Absent: Lisa Qu (St Vincent’s). 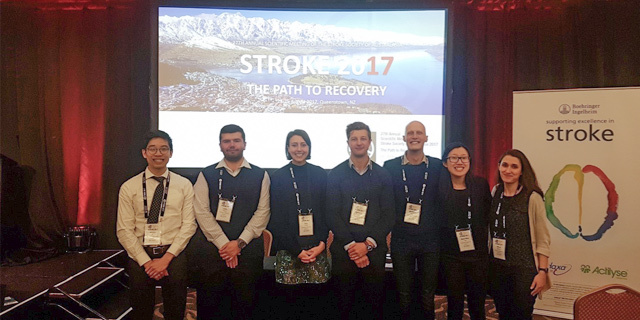 Melbourne Medical School students were very much involved in the recent Stroke Society of Australasia annual scientific meeting held in Queenstown in New Zealand. As part of the MD program, students undertake a 12-month research project. Many of the students publish their work at the end, and present their research at national and international conferences. Under the leadership of Dr Lauren Sanders – St Vincent’s Clinical School MDRP coordinator and supervisor, a number of medical students were able to share their work with the wider stroke research community. Congratulation to Lauren and the students in presenting their work.